"And I think to myself… What a wonderful world…"
A wonderful world indeed does Miyazaki Hayao craft. And a wonderful world it is when one can share that world with him on the big screen for an entire week. I started the week with an old favorite (Nausicaä) and ended it with a new one (Mimi wo Sumaseba) Michael Johnson summed it up quite well when he said this was our "Pilgrimage to Mecca". It was wonderful to be able to see almost all of Studio Ghibli's works. They did not show On Your Mark, Umi Ga Kikoeru (I Can Hear the Sea / Ocean Waves), or Houhokekyo Tonari no Yamada-kun (My Neighbors the Yamadas). The only bummer of this is I wanted to see Umi Ga Kikoeru and to have seen On Your Mark (for which I flew to Japan the following day to pre-order after the Team Ghiblink crew showed it for the first time at Anime Expo - made for an interesting talk with the girl at Animage in Kichijoji) on the big screen in Dolby Digital would have been amazing. I was unable to catch Heisei Tanuki Gassen Pom Poko (Pom Poko) due to illness and I just could not bring myself to see Hotaru no Haka (Grave of the Fireflies) for a second time (having seen it opposite Tonari no Totoro in the theatres in Japan). Being able to watch almost all of Ghibli's films in a short period, I could see the advances made in each follow-on release from Studio Ghibli in the areas of sound and visual. Where Nausicaä was in mono and used somewhat "washed-out" colors, Mimi was one of the best Dolby Digital presentations I have ever heard (better even then Mononoke) and the use of color and animation techniques in both it and Mononoke were incredible. A special treat was to be able to see the film with Michael, Rodney, and a bunch of others from Nausicaä.net / Team Ghiblink. Nothing like watching a great film in company that can a) appreciate it, and b) talk insightfully about it afterwards. We also got to show off our cool stuffed animals collection (over the week I came with Jiji, Totoro, Teto, and Yakkul). And now on the movies! Since they were shown on different days, I have decided to comment on them in their original release order in Japan. At the end of Mononoke, I commented to Michael that Mononoke was to Miyazaki that Titanic was to director James Cameron - "How do you top it?" 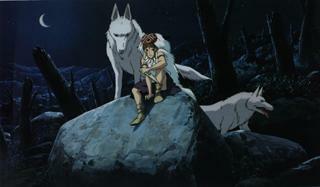 Yet, twelve hours later, I stepped out of this film more satisfied than I had been seeing Mononoke. I admit it may have been seeing Nausicaä subbed and Mononoke dubbed. While I had no qualms or problems with the cast Miramax assembled or their efforts, I admit that I like my movies in their original aspect ratios and soundtracks. However, I try not to let that color my judgement on the movies themselves. I am not too proud to admit that I did indeed cry at the end of this film. The emotional impact of it on a small TV screen is just amplified that much more when you see it on the big screen. Add to that a compelling story and a wonderful heroine - how can you go wrong? When asked "Which anime character would you most like to meet in real life?" my answer has always been, and will probably always be, Princess Nausicaä, for the reason that I think that I could learn a great deal from her. 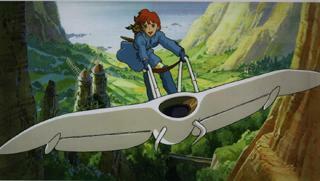 On technical aspects, I consider Nausicaä to be to Studio Ghibli what Star Wars: A New Hope was to Industrial Light and Magic. 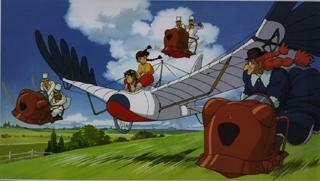 Though Studio Ghibli's first movie, you can see some of the "camera" angles and "motion shots" that would re-appear and be refined in later films, such as Porco and Mononoke. One area where Nausicaä seriously fails (and this may be the theatre, but considering how great everything else sounded…) is the soundtrack. Not Hisaishi's score, mind you (which is a favorite), but just that the film soundtrack is so bright that I feared sunburn if I sat too close to a speaker. If ever a film could benefit from THX CinemaEQ, this one could. *niko niko* I am hoping that Miyazaki and Disney do a complete restore of this film (the print was in pretty good condition) and re-mix the sound effects and *original* score in Dolby Digital. I was fortunate to see this movie in Japan around April 1984 while on a trip. However, being over fifteen years, I have no memories of that event. So this was essentially seeing it in the theatre for the first time for me. What a difference two years can make. Laputa was a large jump forward for Ghibli from Nausicaä, with a stereo soundtrack (a darn good one, at that) and more vibrant colors. And Muska is still the best Ghibli "villain". 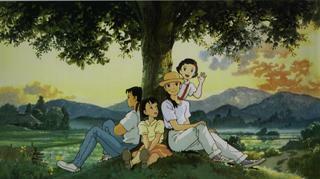 And, as is always the case with Miyazaki, the story was excellent. Last time I saw Laputa in the theatre, it was the Carl Macek dub, which also happened to be here at the Egyptian. I was hoping that Disney was going to send us Castle in the Sky, but it appears that the final version of the film is not yet ready. Well, we can always hope. I love this film for one simple reason - it shows that, if you believe, magic still exists in the world. 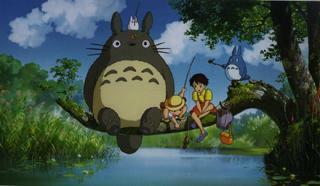 In a way, so does Mononoke, but Totoro sure delivers the message in a much happier package. The Disney dub was shown this year, and the upgrade to the theatre's sound system since the May premiere allowed the film to be presented in Dolby Digital. Though my (former) favorite, this was the film I cared least about seeing - mainly cause I had seen the Disney release in May, as well as having attended the original Japanese and UW premieres. This movie really surprised me - for the better. 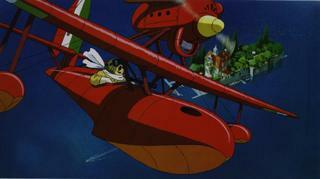 As with Porco, I had only seen snippets of this film, and all of them being flashback scenes. As I was explaining to Rodney Smith last night after Laupta, I was under the impression the entire film was done with that sepia-tone hue used for the flashback scenes. 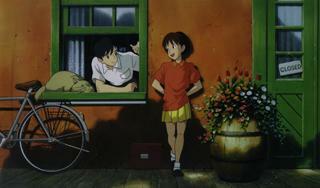 So I was amazed at the "realtime" scenes, as Ghibli really did an excellent job with the colors and character details. Other than Nausicaä, this was the film I wanted to see most at the exhibition, as from what little I had seen really impressed me (plus I worship C-Ko's music video of Alphaville's "Forever Young" done to this film). I was not disappointed, and found the film a wonderful experience. One note - the print, while excellent in general, did have some serious problems in others. 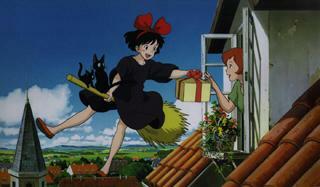 Before 9:30pm, Majo no Takkyubin was my favorite Ghibli film. At 11:30pm, Whisper had soundly trounced that standing. I found it an astoundingly wonderful film on every level. I'm sorry, but Mononoke-hime cannot hold a candle to this one in my opinion. The story is what truly appealed to me, but then maybe it is just the romantic in me that clicked with it so hard. The more I watched it, the more I loved it and the stronger the effect it had on me. The scenes with her and the Baron in "otherspace" were just so cool. Another near-tear-jerker, to be sure. For the record, Michael Johnson (who saw the film with me) and I are considering doing "Concrete Road" at the AX2000 Karaoke Bar. Watch out for it. Like On Your Mark, this film compelled me to catch a flight to Tokyo to buy the LD and CDs - yeah, I could have ordered them, but I needed an excuse to go. *niko niko* Alas, the same girl at Animage from my last trip was not there this time, though the girl there was as amused as the former one. The latest, and widely lauded as best, film from Studio Ghibli and Miyazaki Hayao, is indeed an impressive achievement. This was the first time I have seen this movie in the theatre (I pre-ordered the LD while on a trip in Japan so it was shipped to me within a few days of it's release) and I am pleased with the work the entire Miramax team has done. 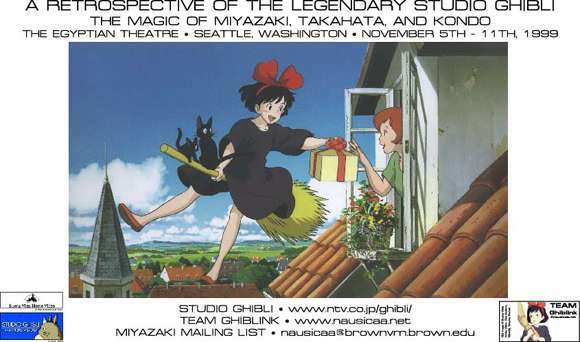 This was the first of many get-togethers amongst the Seattle "Chapter" of the Miyazaki Mailing list, and I was able to show and hand over the movie posters and ID cards I had done.